Welcome to Moffett Vineyards! As a small family producer our wines uniquely reflect our roots from both the Willamette Valley and the Napa Valley. Moffett Vineyards is dedicated to both making the highest quality wines of limited production while emphasizing strong personal relationships with our customers through our wine club and private tastings. Nearly all of our wine club members are people that have visited with us here in the Willamette Valley or at our old home in the Napa Valley. My wife and I have no employees, so all tastings and orders go personally through us. Terrarossa Vineyard is a quaint 2.58-acre vineyard that sits at roughly 800 feet elevation in the Dundee Hills. This backyard vineyard is farmed by Sterling Fox, one of the more respected Organic vineyard managers in the state. Terrarossa Vineyard has 3 different Pinot Noir clones planted, Pommard, 777 and 115; these grapes make a very complex wine with mountain tension and great structure. The wine shows rich dark fruit with bright edges, tannins and spice. The finish is long and mouthwatering; this wine will age very well and should be decanted when possible. 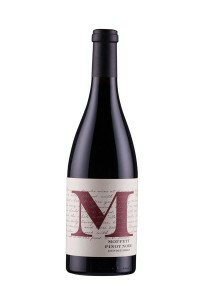 The 2015 Moffett Terrarossa Vineyard will pair with all kinds of food from you fish to smoked chicken or even a nice juicy rib eye, but my favorite pairing is with grilled Salmon. I enjoy putting a thin layer of Dijon Mustard on the top of the filet, then putting the Salmon on a medium to hot grill, skin down and keep the lid closed till it reaches your desired temperature. Simple and really good!